Includes 2 UTMB Points: Verified by the ITRA. 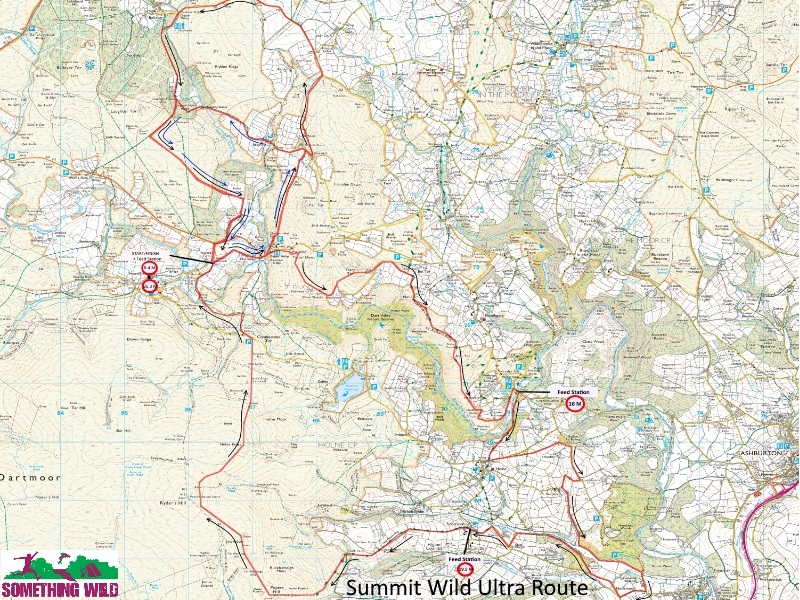 The Summit Wild Ultra is now in its third year at the Something Wild Trail Running Festival. It is the ideal distance for your first ultra – even though it is by no means an easy ultra. It starts alongside the marathon and incorporates the marathon circuit plus one lap of Sunday’s 10K route. The route starts and ends at the festival site at Huccaby Farm, crossing the river at Dartmeet before climbing past Yar Tor to Sherwell and continuing up towards Cator Common. Then there’s a short tarmac section down to Bellever before a gravel climb up to Laughter Hole. Afterwards, you head down to Brimpts farm and a return to the start/finish (and first feed station). Next it’s back to Dartmeet and a long gradual climb to Sharp tor and along Dr Blackalls Drive to New Bridge. From there you will enter Holne Woods and reach the second feed station as you approach Holne. You will cross through Holne down towards Hembury Woods and return (after the 3rd Feed station at Scorriton) via Holne ridge to Coombestone tor. You will still need your wits about you in the final furlong however, as another river crossing beckons, via the Huccaby stepping stones. You will then complete a circuit of the 10k course via Yar Tor and Babeny stepping stones coming back through Brimpts Farm. Registration will be from 7am-8.15am on Sunday in the Cow Shed. The cut off time for this event is 10 hours. NB: In the event of bad weather, we will be re routing the course to cover laps of the 8 mile circuit to Bellever Bridge. In torrential rain we will be avoiding the stepping stones all together.